God loving, wise, and true. 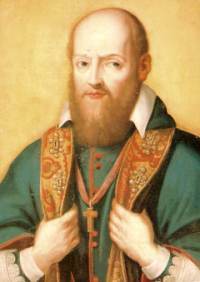 Today is also the 44th World Communications Day, on feast of the saintly patron is Saint Francis de Sales who tirelessly brought the faith to others in an understandable way. Those claiming to be interested in the New Evangelization, especially seminarians, pay attention to what the Pope is saying! What is your diocese doing to reach out to those not hearing the Gospel on Sunday morning? How does your parish measure up to the Pope’s ideas? Does your seminary promote communication, in its various forms, for the good of teaching the faith? Are you, as a Catholic, prepared to meet the post-modern era? If not, why? Responding adequately to this challenge amid today’s cultural shifts, to which young people are especially sensitive, necessarily involves using new communications technologies. The world of digital communication, with its almost limitless expressive capacity, makes us appreciate all the more Saint Paul’s exclamation: “Woe to me if I do not preach the Gospel” (1 Cor 9:16) The increased availability of the new technologies demands greater responsibility on the part of those called to proclaim the Word, but it also requires them to become more focused, efficient and compelling in their efforts. Priests stand at the threshold of a new era: as new technologies create deeper forms of relationship across greater distances, they are called to respond pastorally by putting the media ever more effectively at the service of the Word. identified by the Pope and the Cardinal. In the case of this address, one can’t help thinking of the work of the of new lay movements in the Church and some of the new religious orders doing the hard work of being in the marketplace. I for one, can’t help remember the Pope’s address to the Benedictine Oblates of St Frances of Rome where he praised them for keeping a religious life with a particular focus of being in the center of the city as a witness to Christ while helping the poor. you render the Church in the area of the mission ad gentes [to the peoples]. could describe as “inculturated” (cf. Acts 17:22-31). you. No one will attack and harm you,” (Acts 18:9-10). the plan of salvation” (Insegnamenti XIII, , 1448). the society of the third millennium. show the true face of Christ, lord of history and sole redeemer of man. social and religious challenges of our time. entire human family to call upon God as ‘Our Father! '” (No. 79). heartfelt apostolic blessing to all. Cardinal Avery Dulles is still producing intellectual stimulation. 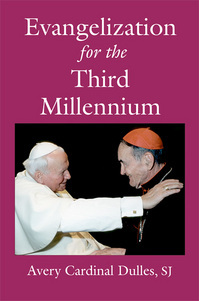 Due to be released next week is Evangelization for the Third Millennium (Paulist Press), the final work that he had already in progress during what became the Cardinal’s final months. In her Preface to this anthology, Cardinal Dulles’ longtime colleague, administrative & research assistant and former student, Sister Ann-Marie Kirmse, says that Dulles’ work explores the theme of evangelization based on the seminal work of Pope Paul VI and later on the work Pope John Paul II on the same topic. Avery Cardinal Dulles, SJ, died on December 12, 2008. Evangelizing is an act of service done out of love, like parents when they teach their children to pray. They are giving their children the best they have. They are giving them the foundations of their faith. This is the reason that should impel the growth of … the Church: to grow more so as to evangelize more; to grow in holiness so as to be better witnesses of Christ in the world. To grow in holiness, to grow in love, to grow in hope so as to bring others to faith, love, and hope. What would Saint Paul tell us today if he came to see us? What would he ask of us? What would he pass on to us? Certainly, he would remind us of the words he once wrote to the community in Corinth: “Do you not know that in a race all the runners run, but only one gets the prize? Run in such a way as to get the prize.” (1 Cor 9:24)Saint Paul insists very much on prayer. 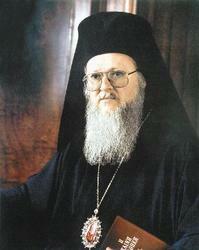 He said: “Pray always.” Prayer is conversation with God; it is the nourishment of the apostle, of the evangelizer. Today, in these times when we live in such adverse environments, prayer becomes even more important. Prayer shows us that our commitment to evangelization comes from Christ. To evangelize is to give what we have received; it is to preach the Christ I have met in prayer. 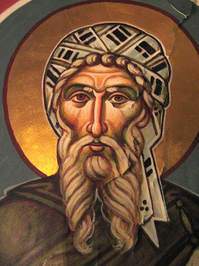 Saint Paul began his work of evangelization after three years of solitude and prayer in the deserts of Arabia. Contemplation and apostolate always go hand in hand. This gracious invitation of Your Holiness to our Modesty is a gesture full of meaning and significance — we dare say an historic event in itself. For it is the first time in history that an Ecumenical Patriarch is offered the opportunity to address a Synod of the Bishops of the Roman Catholic Church, and thus be part of the life of this sister Church at such a high level. We regard this as a manifestation of the work of the Holy Spirit leading our Churches to a closer and deeper relationship with each other, an important step towards the restoration of our full communion. 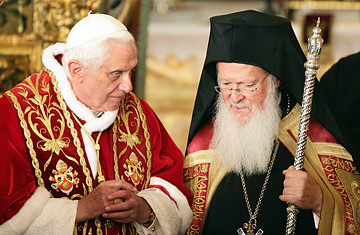 It is well known that the Orthodox Church attaches to the Synodical system fundamental ecclesiogical importance. Together with primacy synodality constitutes the backbone of the Church’s government and organisation. As our Joint International Commission on the Theological Dialogue between our Churches expressed it in the Ravenna document, this interdependence between synodality and primacy runs through all the levels of the Church’s life: local, regional and universal. Therefore, in having today the privilege to address Your Synod our hopes are raised that the day will come when our two Churches will fully converge on the role of primacy and synodality in the Church’s life, to which our common Theological Commission is devoting its study at the present time. only for the Roman Catholic Church but also for all those who are called to witness to Christ in our time. 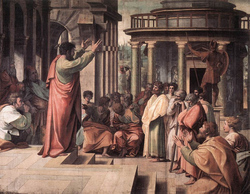 Mission and evangelization remain a permanent duty of the Church at all times and places; indeed they form part of the Church’s nature, since she is called “Apostolic” both in the sense of her faithfulness to the original teaching of the Apostles and in that of proclaiming the Word of God in every cultural context every time. The Church needs, therefore, to rediscover the Word of God in every generation and make it head with a renewed vigour and persuation also in our contemporary world, which deep in its heart thirsts for God’s message of peace, hope and charity. As disciples of God’s Word, then, it is today more imperative than ever that we provide a unique perspective — beyond the social, political, or economic — on the need to eradicate poverty, to provide balance in a global world, to combat fundamentalism or racism, and to develop religious tolerance in a world of conflict. In responding to the needs of the world’s poor, vulnerable and marginalized, the Church can prove a defining marker of the space and character of the global community. While the theological language of religion and spirituality differs from the technical vocabulary of economics and politics, the barriers that at first glance appear to separate religious concerns (such as sin, salvation, and spirituality) from pragmatic interests (such as commerce, trade, and politics) are not impenetrable, crumbling before the manifold challenges of social justice and globalization. the Holy Eucharist. It is there that the Word becomes flesh and allows us not simply to hear or see Him but to touch Him with our own hands, as St. John declares (I John 1,1) and make Him part of our own body and blood (σύσσωμοι καί σύναιμοι) in the words of St. John Chrysostom. In the Holy Eucharist the Word heard is at the same time seen and shared (κοινωνία). It is not accidental that in the early eucharistic documents, such as the book of Revelation and the Didache, the Eucharist was associated with prophesy, and the presiding bishops were regarded as successors of the prophets (e.g. 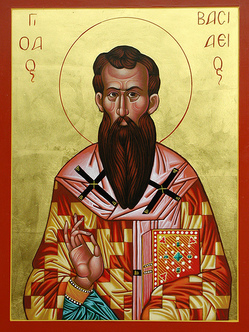 Martyrion Polycarpi). The Eucharist was already by St. Paul (I Cor. 11) described us “proclamation” of Christ’s death and Second Coming. As the purpose of Scripture is essentially the proclamation of the Kingdom and the announcement of eschatological realities, the Eucharist is a foretaste of the Kindom, and in this sense the proclamation of the Word par excellence. In the Eucharist Word and Sacrament become one reality. The word ceases to be “words” and becomes a Person, embodying in Himself all human beings and all creation. Within the life of the Church, the unfathomable self-emptying (κένωσις) and generous sharing (κοινωνία) of the divine Logos is reflected in the lives of the saints as the tangible experience and human expression of God’s Word in our community. In this way, the Word of God becomes the Body of Christ, crucified and glorified at the same time. As a result, the saint has an organic relationship with heaven and earth, with God and all of creation. 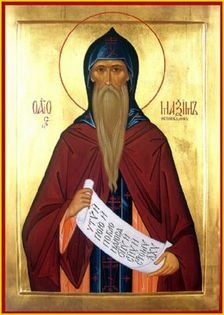 In ascetic struggle, the saint reconciles the Word and the world. Through repentance and purification, the saint is filled — as Abba Isaac the Syrian insists — with compassion for all creatures, which is the ultimate humility and perfection. This is why the saint loves with warmth and spaciousness that are both unconditional and irresistible. In the saints, we know God’s very Word, since — as St. Gregory Palamas claims — God and His saints share the same glory and splendor.” In the gentle presence of a saint, we learn how theology and action coincide. In the compassionate love of the saint, we experience God as “our father” and God’s mercy as “steadfastly enduring.” (Ps. 135, LXX) The saint is consumed with the fire of God’s love. This is why the saint imparts grace and cannot tolerate the slightest manipulation or exploitation in society or in nature. The saint simply does what is “proper and right” (Divine Liturgy of St. John Chrysostom), always dignifying humanity and honoring creation. “His words have the force of actions and his silence the power of speech” (St. Ignatius of Antioch). And within the communion of saints, each of us is called to “become like fire” (Sayings of the Desert Fathers), to touch the world with the mystical force of God’s Word, so that — as the extended Body of Christ — the world, too, might say: “Someone touched me!” (cf. Mt 9.20) Evil is only eradicated by holiness, not by harshness. And holiness introduces into society a seed that heals and transforms. Imbued with the life of the sacraments and the purity of prayer, we are able to enter the innermost mystery of God’s Word. It is like the tectonic plates of the earth’s crust: the deepest layers need only shift a few millimeters to shatter the world’s surface. Yet for this spiritual revolution to occur, we must experience radical metanoia — a conversion of attitudes, habits and practices — for ways that we have misused or abused God’s Word, God’s gifts and God’s creation. Such a conversion is, of course, impossible without divine grace; it is not achieved simply through greater effort or human willpower. “For mortals, it is impossible; but for God all things are possible.” (Mt 19.26) Spiritual change occurs when our bodies and souls are grafted onto the living Word of God, when our cells contain the life-giving blood-flow of the sacraments, when we are open to sharing all things with all people. As St. John Chrysostom reminds us, the sacrament of “our neighbor” cannot be isolated from the sacrament of “the altar.” Sadly, we have ignored the vocation and obligation to share. Social injustice and inequality, global poverty and war, ecological pollution and degradation result from our inability or unwillingness to share. If we claim to retain the sacrament of the altar, we cannot forgo or forget the sacrament of the neighbor — a fundamental condition for realizing God’s Word in the world within the life and mission of the Church. hearing and speaking God’s Word in Scripture, of seeing God’s Word in icons and nature, as well as of touching and sharing God’s Word in the saints and sacraments. Yet, in order to remain true to the life and mission of the Church, we must personally be changed by this Word. The Church must resemble the mother, who is both sustained by and nourishes through the food she eats. Anything that does not feed and nourish everyone cannot sustain us either. When the world does not share the joy of Christ’s Resurrection, this is an indictment of our own integrity and commitment to the living Word of God. Prior to the celebration of each Divine Liturgy, Orthodox Christians pray that this Word will be “broken and consumed, distributed and shared” in communion. And “we know that we have passed from death to life when we love our brothers” and sisters (1 Jn 3.14). For you are good and love humankind. Amen!